This article introduces a child-friendly research protocol designed to improve data quality by reducing head movement during pediatric magnetoencephalography (MEG). We familiarize families with the MEG environment, train children to remain still using an MEG simulator, and correct for residual head movement artefacts using a real-time head movement detection system. Rapaport, H., Seymour, R. A., Sowman, P. F., Benikos, N., Stylianou, E., Johnson, B. W., Crain, S., He, W. Studying Brain Function in Children Using Magnetoencephalography. J. Vis. Exp. (146), e58909, doi:10.3791/58909 (2019). Magnetoencephalography (MEG) is a non-invasive neuroimaging technique which directly measures magnetic fields produced by the electrical activity of the human brain. MEG is quiet and less likely to induce claustrophobia compared with magnetic resonance imaging (MRI). It is therefore a promising tool for investigating brain function in young children. However, analysis of MEG data from pediatric populations is often complicated by head movement artefacts which arise as a consequence of the requirement for a spatially-fixed sensor array that is not affixed to the child's head. Minimizing head movements during MEG sessions can be particularly challenging as young children are often unable to remain still during experimental tasks. The protocol presented here aims to reduce head movement artefacts during pediatric MEG scanning. 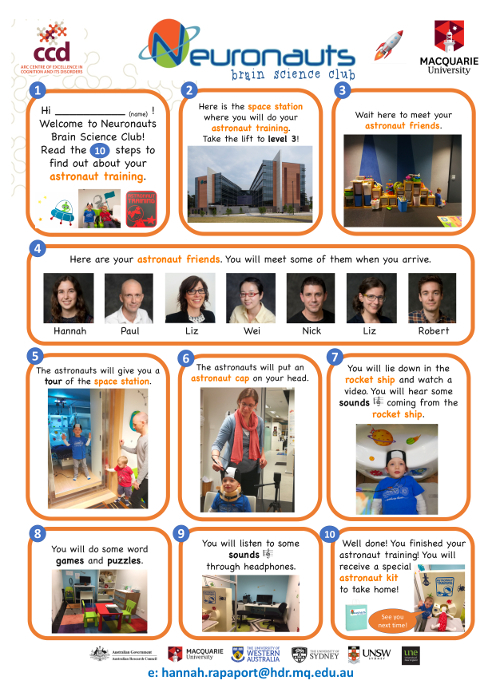 Prior to visiting the MEG laboratory, families are provided with resources that explain the MEG system and the experimental procedures in simple, accessible language. An MEG familiarization session is conducted during which children are acquainted with both the researchers and the MEG procedures. They are then trained to keep their head still whilst lying inside an MEG simulator. To help children feel at ease in the novel MEG environment, all of the procedures are explained through the narrative of a space mission. To minimize head movement due to restlessness, children are trained and assessed using fun and engaging experimental paradigms. In addition, children's residual head movement artefacts are compensated for during the data acquisition session using a real-time head movement tracking system. Implementing these child-friendly procedures is important for improving data quality, minimizing participant attrition rates in longitudinal studies, and ensuring that families have a positive research experience. Magnetoencephalography (MEG) is a non-invasive functional neuroimaging technique which measures magnetic fields produced by the electrical activity of the human brain1,2. MEG offers excellent temporal resolution and superior spatial resolution compared with electroencephalography (EEG) due to the lack of signal smearing from the biological tissues between the brain sources and the sensors. In addition, MEG does not involve exposure to loud noises, radiation or magnetic fields. Set-up time is rapid and participants can be accompanied by a parent or caregiver throughout testing. Taken together, these features make MEG a promising tool for investigating the development of typical and atypical brain function in young children2. To measure brain responses using MEG, research participants must insert their heads into a helmet housing a fixed array of superconducting sensors. It is crucial that the participants keeps their heads still throughout the MEG recording, as changes in the head position relative to the sensors both degrade the neuromagnetic signal distribution and impede accurate source estimation. Inaccurate source estimation inevitably leads to inaccurate statistical inferences in source power, functional connectivity and network analyses3. Minimizing head movement can be particularly challenging during pediatric MEG assessment for a number of reasons. First, assessing young children in an adult MEG system is problematic as children's heads are much smaller than those of adults, and the increased space between the helmet and the child's scalp allows for unconstrained head movement. Second, the novel MEG environment — a large machine locked inside a windowless magnetically shielded room — can be intimidating for young children, and head movement may be a consequence of anxiousness. Third, without training, children may not fully understand or comply with the requirement to remain still for the duration of the experiment. Finally, children who have a limited capacity to tolerate boredom may find that some MEG experiments take too long or are tedious, resulting in restlessness and head movement artefacts. To tackle the long-standing challenge of head movement in pediatric MEG research, this article presents recent hardware and methodological advances that are implemented in the child-friendly MEG protocol used at the KIT-Macquarie Brain Research Laboratory (Macquarie University, Sydney, Australia). As outlined in a previous paper from this laboratory4, the problems involved in the use of a loose-fitting adult-sized helmet dewar have been addressed by installing a world-first, whole-head pediatric MEG system with a bespoke helmet dewar to better fit the heads of young children between approximately three-to-six years of age. This hardware adaptation improves the signal-to-noise ratio, as the sensors are physically closer, on average, to the child's scalp5,6. More recently, the KIT-Macquarie Brain Research Laboratory has developed several new and novel procedures to overcome the aforementioned antecedents of head movement and hence to improve data quality. All of the procedures in this protocol are explained through a narrative in which the child participant actively engages in an "astronaut space mission". This narrative ensures that the child's MEG research experience is not only less intimidating, but also exciting. Implementing these procedures into a child-friendly MEG protocol is important for improving data quality, minimizing participant attrition rates in longitudinal studies, and ensuring that families have a positive experience in their research participation. This research protocol has been approved by the Macquarie University Human Research Ethics Committee. Provide families with resources to learn about MEG prior to visiting the MEG laboratory, such as a child-friendly scientific article7 explaining MEG and the MSR, a story-board detailing the steps involved in completing the MEG experiment (e.g., Supplementary Figure 1 and an MEG information sheet for parents or caregivers (e.g., Supplementary Figure 2). NOTE: The familiarization session typically runs for 30 min, including an introduction to the MSR (5 minutes), a practice digitization (5 min), and MEG simulator training, including practice on the experimental task (20 min). Conduct the familiarization session between one-to-seven days prior to data acquisition. Take the child on a tour of the MSR ("spaceship") which is decorated in space-related wall art to reinforce the space mission theme. Ask the child to practice lying back with their head in the helmet dewar. Tell the child to lie as still as possible so that the spaceship stays on course and can reach its final destination. Seat the child on a high chair and fit them with a polyester swimming cap ("astronaut helmet") containing five marker coils. Adapt loose-fitting caps by folding up the sides. NOTE: The coils send data to a continuous motion tracking unit. Place a transmitter and three receivers around the child's neck. Ask the child to demonstrate their best 'statue' pose and offer frequent positive reinforcement when they stay still. NOTE: This serves to minimize head movement during digitization that may compromise the accuracy of the subsequent co-registration with the MEG sensors8. Use a pen digitizer (see Table of Materials) to record the position of three fiducial points (the nasion and left and right pre-auricular points) and the five marker coils, as well as the shape of the surface of the head. NOTE: This data is used to later determine the position of the child's head in relation to the MEG sensors. Remove the cap, transmitter and three receivers from the child's neck. Briefly describe the MEG scanning procedures (i.e., lying still and participating in the practice experimental task) through the narrative of a practice space mission. Fit the child with an 'astronaut helmet' — a polyester swimming cap which has a motion detector attached at the front (see Table of Materials). Invite the child to lie in the simulator and watch a video of their choosing. If the child appears nervous, first demonstrate the experimental procedures with a toy. NOTE: Whenever the child's head movement exceeds a pre-determined threshold (e.g., 5 mm), the motion tracking system (see Table of Materials) will automatically pause the video and wait for the experimenter to manually restart the video and restore the movement baseline. When the child completes this part of the simulator training, provide the child with training on the experimental task using a separate set of unique stimuli. At the end of the task training, offer the child an astronaut training certificate. NOTE: The data acquisition session typically runs for approximately 30 min, including digitization (5 min), setting up the participant inside the MSR (5 min) and data acquisition (approximately 20 min, depending on the length of the experimental paradigm). Conduct a 30-to-60 s empty room recording approximately 15 min before the child arrives to identify any significant external noise that is detected by the MEG system8. When the child arrives, confirm that they are not wearing any magnetic material on their clothes or carrying any in their body, as magnetic materials can distort the MEG signal (see Figure 1B for an example of signal noise due to metal on the participant). NOTE: If the parent or caregiver wishes to accompany their child inside the MSR, the removal of magnetic materials applies to them too. Check whether the child needs to go to the toilet before commencing digitization, as once the digitization step is completed, the cap cannot be removed until the MEG acquisition session has finished. Repeat the digitization procedure outlined in the "MEG familiarization session" section above. Take the child to the MSR ("the spaceship"). NOTE: Two researchers are required for this procedure — one to accompany the child inside the MSR as the "assistant researcher" (along with the parent or caregiver, if desired) and one to run MEG data acquisition outside the MSR as the "main researcher". The MSR set-up typically takes 5 min. Ask the child to place their head into the helmet dewar. Check that the child's head is centrally aligned such that the crown of the head is as close as possible to the back of the helmet dewar without touching. Ensure that the child is comfortable, relaxed, and remains as still as possible during MEG recording. During the set-up, keep the child entertained by playing a video of their choosing on a screen above the dewar. Conduct a pre-experiment/baseline marker coil measurement to record the initial head position with respect to the helmet dewar. Conduct a co-registration between the child's head and the sensor array using both the initial marker coil measurement and the digitization head shape data. NOTE: These preparatory measurements enable visual inspection of head position inside the dewar to ensure that the child's head is correctly positioned. If these conditions are not met, re-position the child and conduct another co-registration before starting data acquisition. Once satisfied with the head position with respect to the helmet dewar, start the MEG recording and the experimental task. 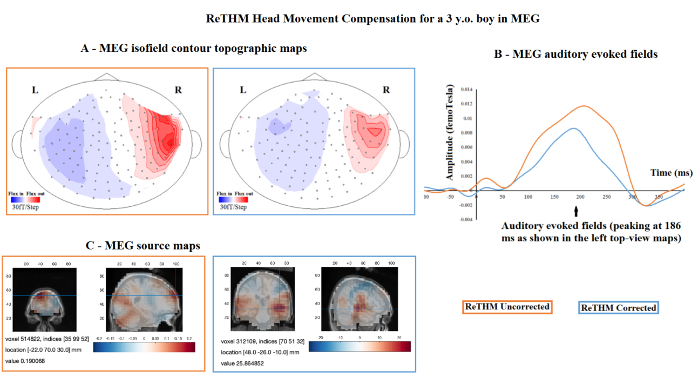 Record ongoing head movements with a pediatric MEG software system called Real-Time Head Movement (ReTHM)9. When the experimental task is finished, turn off ReTHM and end the MEG recording. Conduct a post-experiment marker coil measurement to measure the final head position with respect to the helmet dewar. NOTE: This measurement provides a simple visual inspection of overall head movements during the experiment. Offer the child a gift bag ("astronaut kit") for their participation and remunerate the family for their time and travel costs. Common MEG signals are displayed in Figure 1, including a normal MEG signal (Figure 1A), as well as MEG signal noise due to metal on the participant (Figure 1B), in which case unlock the sensors, open the MSR door and ask the participant to remove any metal from their body, then take the metal object out of the MSR and perform an auto-tune before repeating the procedures outlined in section 3.5; interference from an electronic device (Figure 1C, most often from a mobile phone), in which case turn off any electronic devices or move them away from the MSR; a clenched jaw (Figure 1D), in which case remind the participant to relax their jaw for the duration of the MEG recording; alpha waves (Figure 1E; these are defined by eight to 12 continuous waves in a 1 s interval), in which case check that the participant is not asleep (it is fine to continue if they are awake); and trapped magnetic flux (Figure 1F); in which case unlock the sensors and turn on the coil heaters on for 5 min. If the flux persists after a subsequent auto-tuning, mark affected channel for removal from subsequent data analysis. Pediatric MEG data before and after ReTHM correction is displayed in Figure 2. Data was collected from a three-year-old boy who passively listened to auditory tones for 15 min. Data was de-noised10, band-pass filtered11 (1-15 Hz), baseline-corrected and averaged. Root-mean-square (RMS) magnetic waveforms (in the right column) were computed from all sensors. Averaged in-scanner head movements were 44.3 mm. As demonstrated, ReTHM compensated for motion-related artefacts, resulting in more focal isofield contour maps (at the peak of the RMS waveforms; (A), less distorted RMS magnetic waveforms (B), and more meaningful source reconstruction (C) in the bilateral auditory lobes. Figure 1: Examples of common MEG signals. (A) A normal MEG signal. (B-F) MEG signal noise due to (B) metal on the participant (specifically, noise caused by a small metal buckle on a singlet strap), (C) interference from an electronic device, (D) a clenched jaw, (E) alpha waves, and (F) trapped magnetic flux. For panels C, E, and F, the time scale on the x-axis is in 10-second intervals, and amplitude scale on the y-axis is 32768 A/D. Please click here to view a larger version of this figure. Figure 2. Pediatric MEG data before and after Real-Time Head Movement (ReTHM) correction. Data was collected from a three-year-old boy who passively listened to auditory tones for 15 min. Averaged in-scanner head movements were 44.3 mm. 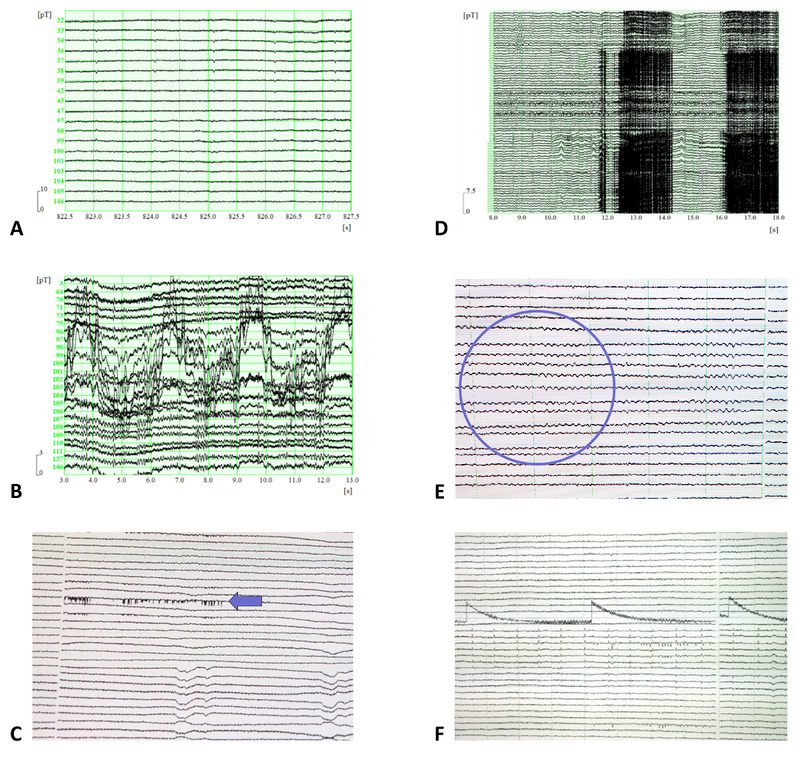 (A) More focused isofield contour maps at the peak of the root mean square (RMS) waveforms; (B) less distorted RMS magnetic waveforms, and (C) more meaningful source reconstruction in the bilateral auditory lobes are revealed after ReTHM correction. Please click here to view a larger version of this figure. Supplementary Figure 1: A story board outlining 10 simple steps for completing the "astronaut training" (i.e., the MEG experiment). This is sent to families prior to visiting the MEG laboratory in order to guide children's expectations for the acquisition session, as well as to build excitement in anticipation of the "astronaut training". On data acquisition day, the children follow the story as the experiment progresses and collect stamps after completing each step. Photographs reproduced with informed written parental consent. Please click here to view a larger version of this figure. 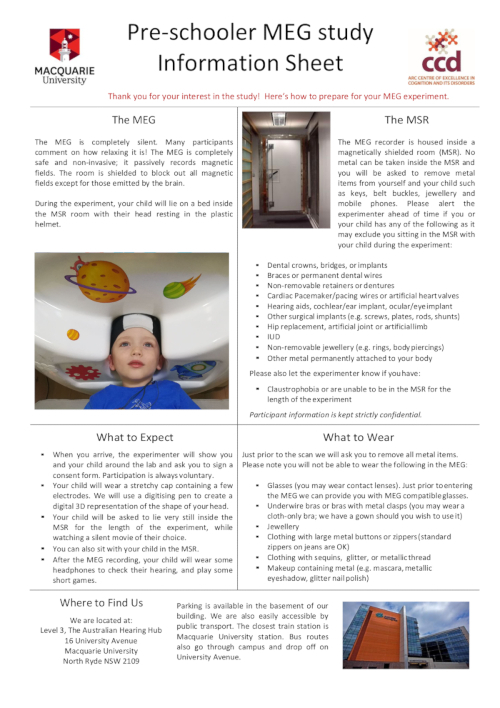 Supplementary Figure 2: An MEG information sheet for parents or caregivers explaining the MEG, the MSR, what to expect on data acquisition day and what to wear. Photograph reproduced with informed written parental consent. Please click here to view a larger version of this figure. In recent years, MEG has been established as a valuable non-invasive neuroimaging technique for investigating the neural mechanisms underpinning brain development1. However, in-scanner head movements pose a notorious barrier to obtaining good quality MEG data, particularly when assessing pediatric populations. To overcome this problem, this article presented a pediatric MEG research protocol which builds upon procedures outlined in a previous paper from the KIT-Macquarie Brain Research Laboratory 4. The critical procedures include (1) providing children with MEG familiarization resources from which they can learn about the MEG experiment prior to visiting the lab, which include a child-friendly research article7 explaining the MEG system and the magnetically shielded room (MSR), a story-board outlining 10 simple steps for completing the MEG experiment (Supplementary Figure 1), and an MEG information sheet for parents and caregivers (Supplementary Figure 2); (2) Preceding the MEG acquisition session with a familiarization session, wherein children are acquainted with MEG procedures and are trained to keep their heads still whilst lying inside an MEG simulator; (3) using passive or "gamified" experimental paradigms to minimize head movement due to boredom and restlessness; and (4) tracking ongoing head movements during online data acquisition using a Real-Time Head Movement (ReTHM) system9. Data obtained from ReTHM can be used to conduct offline correction of head movement artefacts when pre-processing the MEG data. The acquisition of high-quality MEG data critically depends upon the child feeling at ease in the novel MEG environment. To foster this sense of ease, researchers are encouraged to devote time to familiarizing children and their families with the MEG environment and procedures prior to commencing data acquisition. This can be achieved through offering children and their parents MEG resources which explain the MEG procedures in simple, accessible language. Furthermore, families can be invited to visit the MEG laboratory before the data acquisition session to meet the researchers and practice the MEG testing procedures. Through training on the MEG simulator, children implicitly learn the importance of keeping their heads still whilst lying in the MEG. While the MEG familiarization requires both the researchers and the families to devote additional time to the data collection process, the advantages of improving MEG data quality, as well as minimizing the time and cost of conducting subsequent MEG data acquisition sessions, arguably outweighs this downside. Furthermore, performance and compliance during the familiarization session can be used to indicate whether the child is or is not suitable to invite back for an actual MEG data acquisition session. To minimize in-scanner head movement due to restlessness, it is preferable to use a passive experimental paradigm which does not require instructions, overt attention or active participation. For example, a reliable evoked response can be obtained with an auditory oddball paradigm12, whereby the participant passively listens to a sequence of auditory tones whilst entertained by a silent video. For studies requiring an overt response, the researcher should aim to embed the experimental task in an engaging game-style paradigm11. This improves cooperation and minimizes restlessness during the task. In visual experiments, the use of an MEG-compatible eye-tracker entails little additional set-up time but is necessary in ensuring that children have fixated on the position of the visual stimulus13. Any residual head movement artefacts can be corrected for using real-time head motion tracking. For example, data obtained from ReTHM can be stored in the MEG recording file and used to compensate for head movement during data acquisition in such a way that head-to-sensor localization can be restored to the pre-movement level to allow for an optimal source reconstruction which is essential for subsequent source level data analyses14. The implementation of this protocol seeks to improve the quality of pediatric MEG data, minimize participant attrition rates in longitudinal studies, and ensure that families have an enjoyable experience of MEG research participation, with the overarching goal of improving our understanding of early brain development in both typical and atypical populations. This work was supported by the Australian Research Council grants CE110001021, DP170103148 and DP170102407. Wei He was supported by a Macquarie University Research Fellowship (MQRF, IRIS Project: 9201501199). Hannah Rapaport was supported by the Australian Government's Research Training Program (RTP) and the Macquarie University Research Excellence Scholarship (MQRES). Robert A Seymour was supported by PhD scholarships from Aston University, Birmingham, UK and Macquarie University, Sydney, Australia. Paul F. Sowman was supported by the National Health and Medical Research Council (1003760) and the Australian Research Council (DE130100868). The authors acknowledge the collaboration with the Kanazawa Institute of Technology and the Yokogawa Electric Corporation in establishing the KIT-Macquarie Brain Research Laboratory. Baillet, S. Magnetoencephalography for brain electrophysiology and imaging. Nature Neuroscience. 20, 327-339 (2017). Gaetz, W., et al. Magnetoencephalography for clinical pediatrics: Recent advances in hardware, hethods, and clinical applications. Journal of Pediatric Epilepsy. 04, 139-155 (2015). Stolk, A., Todorovic, A., Schoffelen, J. -M., Oostenveld, R. Online and offline tools for head movement compensation in MEG. Neuroimage. 68, 39-48 (2013). Tesan, G., Johnson, B. W., Reid, M., Thornton, R., Crain, S. Measurement Of Neuromagnetic brain function in pre-school children with custom sized MEG. Journal of Visualized Experiments. (36), 2923-2934 (2010). Johnson, B. W., Crain, S., Thornton, R., Tesan, G., Reid, M. Measurement of brain function in pre-school children using a custom sized whole-head MEG sensor array. Clinical Neurophysiology. 121, 340-349 (2010). He, W., Brock, J., Johnson, B. W. Face-sensitive brain responses measured from a four-year-old child with a custom-sized child MEG system. Journal of Neuroscience Methods. 222, 213-217 (2014). Brock, J., Sowman, P. Meg for kids: listening to your brain with super-cool SQUIDs. Frontiers for Young Minds. 2, 10-13 (2014). Gross, J., et al. Good practice for conducting and reporting MEG research. Neuroimage. 65, 349-363 (2013). Oyama, D., et al. 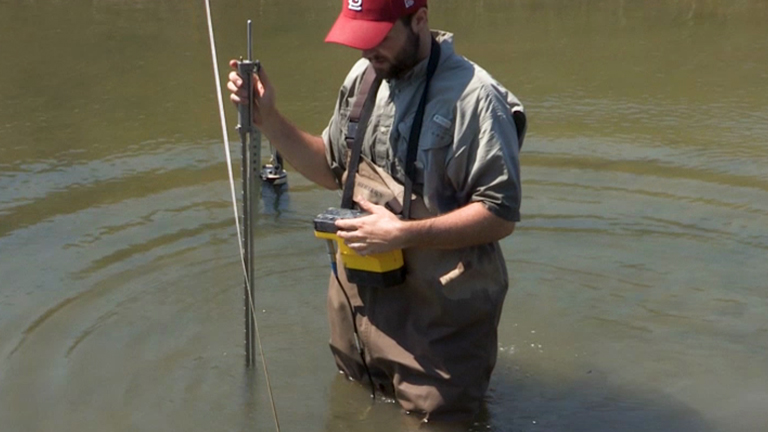 Real-Time coil position monitoring system for biomagnetic measurements. Physics Procedia. 36, 280-285 (2012). de Cheveigné, A., Simon, J. Z. Denoising based on spatial filtering. Journal of Neuroscience Methods. 171, 331-339 (2008). Cheyne, D., Jobst, C., Tesan, G., Crain, S., Johnson, B. Movement-related neuromagnetic fields in preschool age children. Human Brain Mapping. 35, 4858-4875 (2014). Näätänen, R., Pakarinen, S., Rinne, T., Takegata, R. The mismatch negativity (MMN): towards the optimal paradigm. Clinical Neurophysiology. 115, 140-144 (2004). He, W., Brock, J., Johnson, B. W. Face processing in the brains of pre-school aged children measured with MEG. Neuroimage. 106, 317-327 (2015). Wehner, D. T., Hämäläinen, M. S., Mody, M., Ahlfors, S. P. Head movements of children in MEG: quantification, effects on source estimation, and compensation. Neuroimage. 40, 541-550 (2008).